In all likelihood, this is going to be my final FO for 2010. But I am glad that this is done. Folks, I give you my version of the Honey Cowl. Knitted with just 2 skeins of Tosh 80/10/10 MCN Worsted, it’s the perfect width for me. I didn’t want it to be too wide so I stopped after using up the second skein. The final width is 6.5 inches with the edges rolled up. I cast on 232 stitches and knitted only 3 rows of stockinette on both ends. I love how you can wear this garment in three ways and still look amazing. 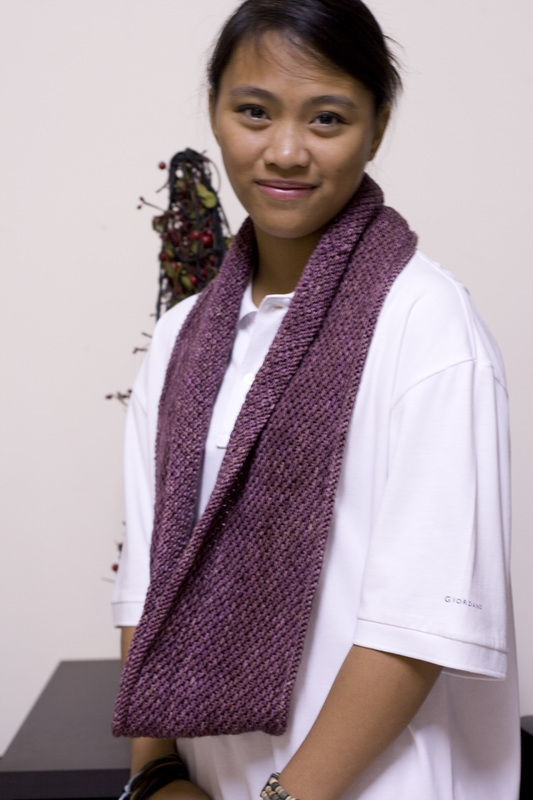 As an eternity scarf, 232 stitches gives you just enough length. 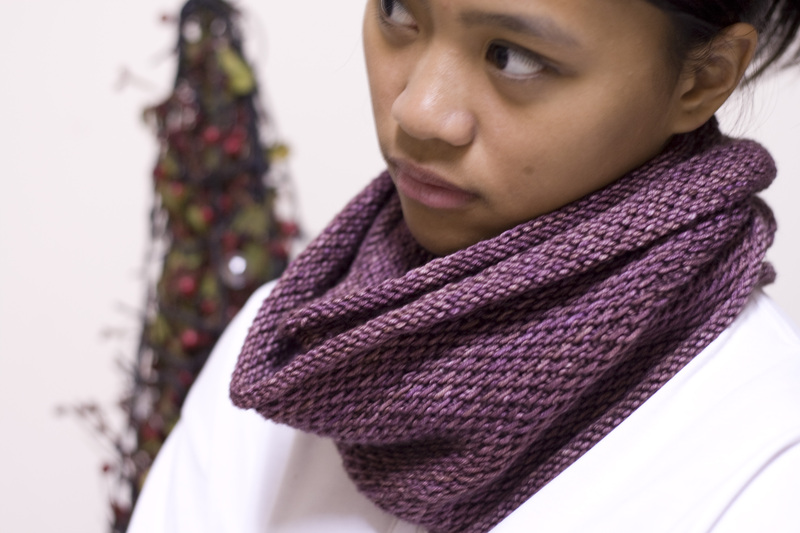 The scrumptous merino-cashmere-nylon blend makes it difficult to resist twisting the scarf and turning it into a cowl. Next to the skin is where this yarn should be. It’s warm, it’s soft and very cushy so I think this will be my favourite way to wear this scarf. Of course with 6.5inches of width you can still pull it up over your head and protect it from the cold. This is great esp as we plan to be up on the office rooftop again this year to watch the New Year’s Eve fireworks along Jumeirah Beach. his project had been a wonderful knit, the yarn and the mindless stitch pattern make for a great combination. No wonder there are over 950 projects on Ravelry! Notes: The first skein was knotted in two places so I undid the knots and joined the two ends as you would for a new skein. The joins looked a bit chunky at first but after waving in the end, it didn’t seem so bad. One of my goals for 2011 is to learn to knit. Any tips for a newbie on how to get started? I love your purple cowl, by the way. It’s lovely. Did you know that there’s a new knitter born every 5 minutes? Okay so I totally made that up, but it’s probably true. ravelry.com is a great place to start to get to know other knitters all over the world. I actually learned by watching videos on knittinghelp.com and then taught myself how to knit. You might want to try and find a local yarn store (lovingly called LYS in the knitting circle), they will usually have lessons for beginners and obviously will be stocked with all the supply you could possibly need to get started. YouTube is also great since most knitters/teachers post short how-to videos as some knitters, like me, learn by sight. Give me a shout any time if you have more questions. I so love that last picture! I wish I had made the Honey Cowl I knitted longer.